According to studies, Christmas is the most celebrated holiday in the world. This is evidently true as seen on how much people pour their efforts in preparation of the holiday. Every facet of this special occasion is something to prepare for. That is why, no doubt, Christmas is such an important celebration for many. 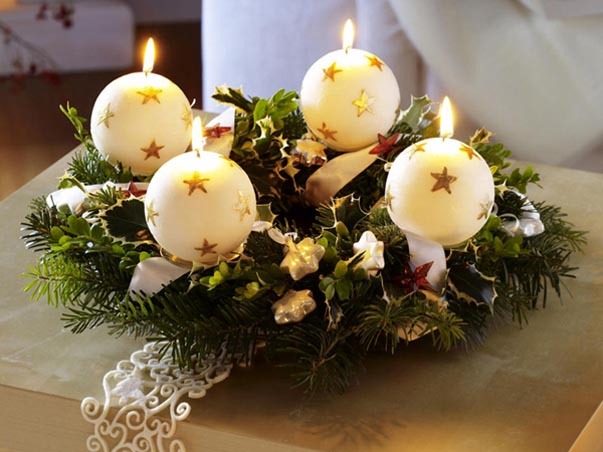 Parties, events and other gatherings will always be there as the Christmas season sets in. Most of the times, these are not just your ordinary get-togethers. More often than not, these are annual events that require everyone to look and be at their best game. Make sure you got everything perfect, including your nails too with these easy-to-do nail art designs. The styles are all apt for the holiday season. These designs are not just fitting the Christmas theme – they are lively and cheerful. Give your nails the trendiest of colors and party with a style. 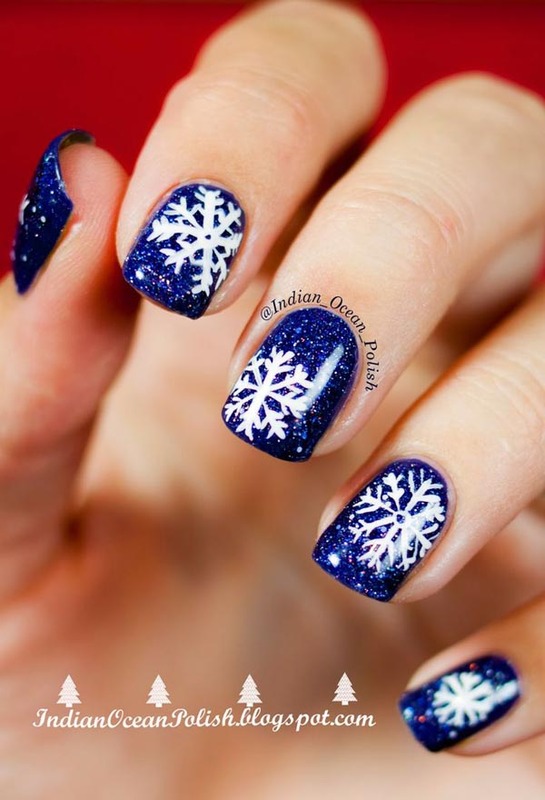 White hand-painted snowflakes intricately drawn on glistening blue background is definitely of Christmas. The snowflakes stand out on the blue black draft. It’s simple yet gorgeous. It’s glittering but yet trendy. 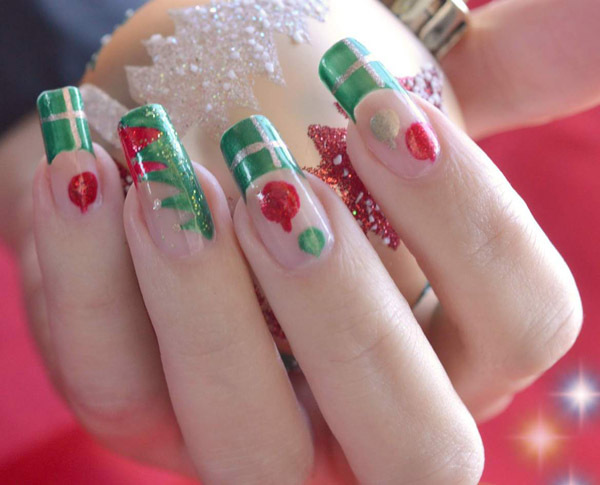 This simple nail art design shows all the classic colors of Christmas. 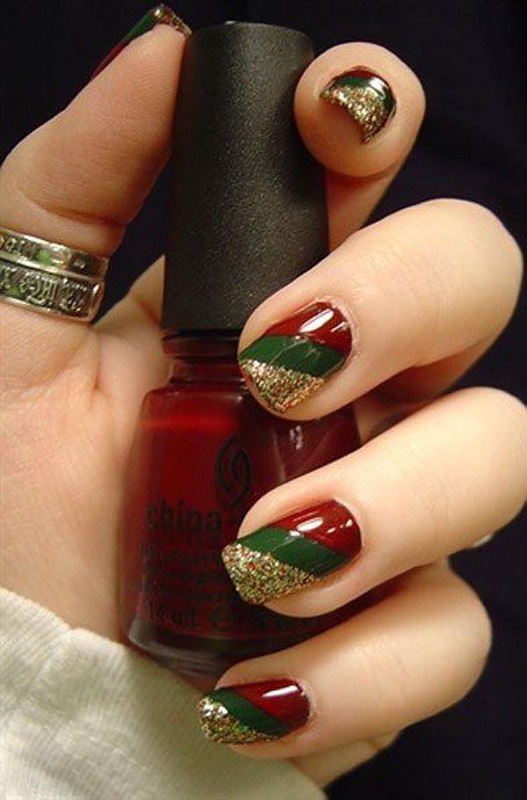 The stripes of red, green and gold are definitely apt for the holiday season. To make it more pleasing, choose the rich vivid ones. It’s definitely the perfect combination of nice and simple. 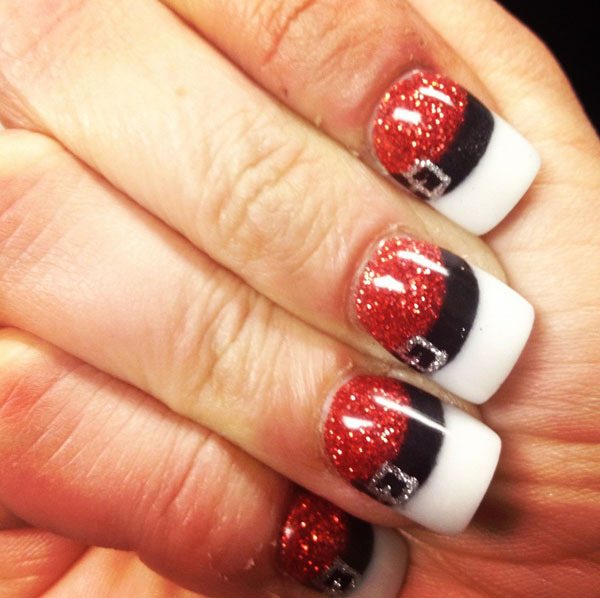 This Santa Claus nail art design is absolutely suited for the holidays. The glittering colors are nothing short of a sparkling beauty. The main theme is that of Santa’s belt. You could also turn those fresh French tips into this easy nail art piece. 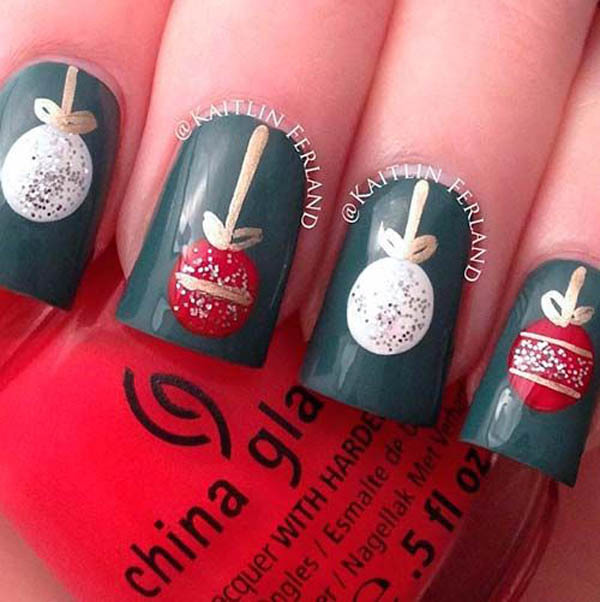 This Christmas nail art design is definitely made just for the holidays. One finger of different style complements the rest of the designs. The sparkling red color is truly astounding. The gold ribbon embellishment definitely stands out. 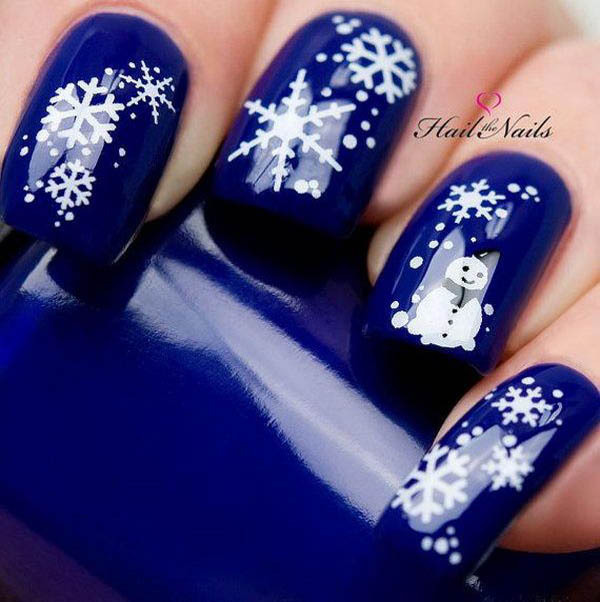 Bring the Christmas spirit on right on your fingertips with this stunning nail art. It’s a mix and match of different iconic Christmas figures – Santa, Rudolph and Snowflakes. Opt for the light base polish. The glittering green tip and the red spots underneath are the perfect décor. 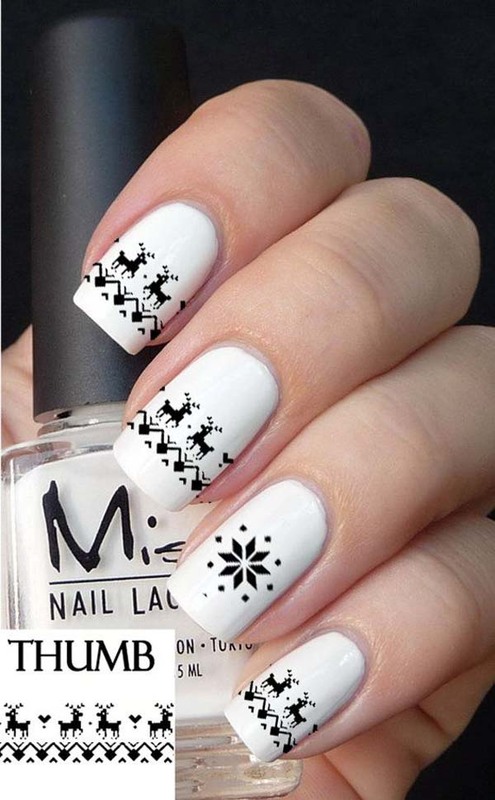 Reindeers as your nail art for those holiday parties are definitely awesome. 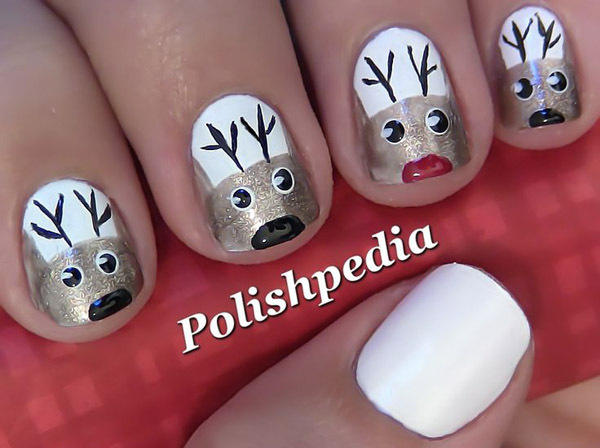 Make your own Rudolph by using red polish as the nose. The rest of its glittering colors are definitely festive. It’s cute and adorable both at the same time. 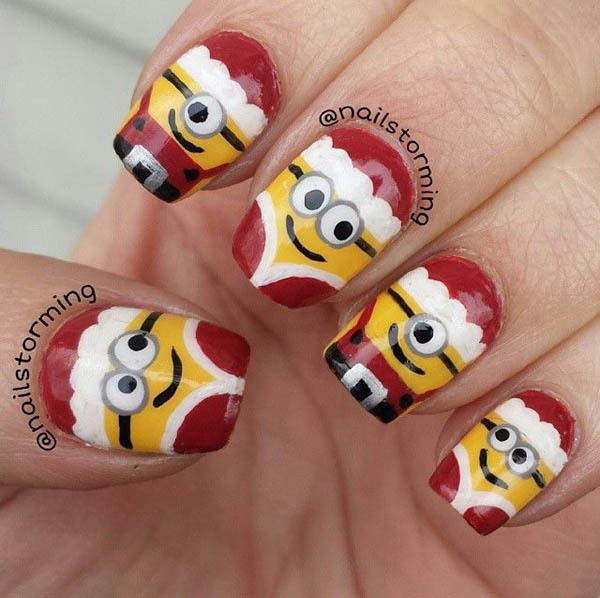 This cartoon-inspired nail art design absolutely sings the Christmas tune. The variations in style in each of your fingernails arenot just trendy but also hip. The white designs on the red base background are absolutely lovely. It is definitely easy to do with just some few steady strokes. 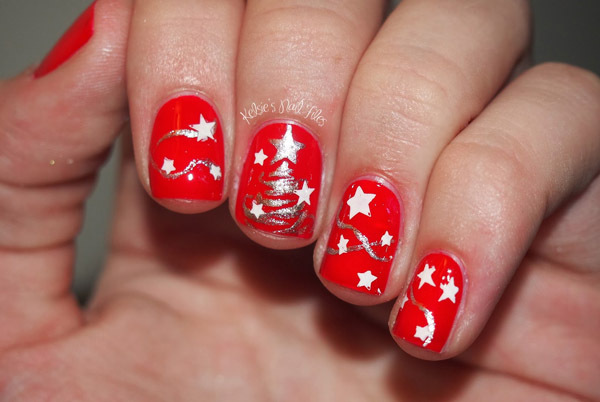 This elegant holiday nail art is such an easy theme to recreate. The white snowflakes are in sync with the festivities. The velvety look of the base polish connotes style and elegance. Add some white dots for a more stunning effect. Those cute and cuddly minions are not just for the kids to enjoy. These nail art inspired by these lovable creatures are just too delightful to look at. The red and yellow colors of it are lively. It’s casual yet so trendy. 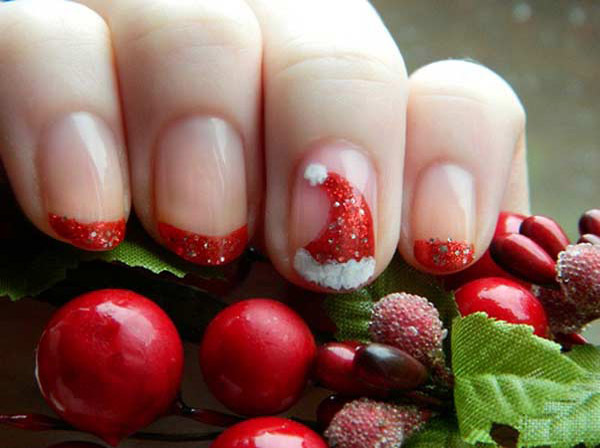 Make your nails your friend’s envy this holiday season with this charming nail art suited just for the holidays. The alternating colors and design on the lollipops are definitely hip. The glittering colors of these lollipops complements with the festive mood. The contrasting hue and tint of the background polish makes it stand out more. The iconic gingerbread house makes your nails a whole lot brighter this holiday season. The white bottom part with those colorful mini circles is positively jolly. The door drawn from the tips definitely made the catch. Color the rest of the house with some beige polish. Nothing says “It’s Christmas” than those Christmas trees! 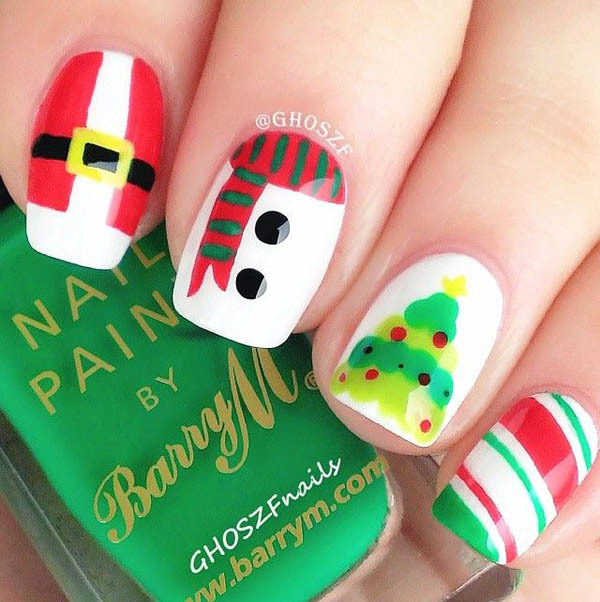 Use your fingernails to create the perfect tree with this unique nail art design. Some velvety polish for the tree would do the trick really well. Add colors by putting pieces of studs on it and star topper to complete the tree. Red polish is always the staple color for manicures. 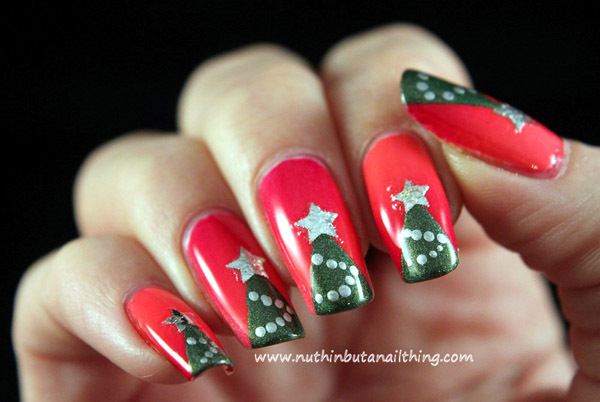 Make this classic choice more cheerful this yuletide season with this easy to do nail art theme. Use some glittering silver polish to draw the stars. Some glistening swirls on them make the difference. 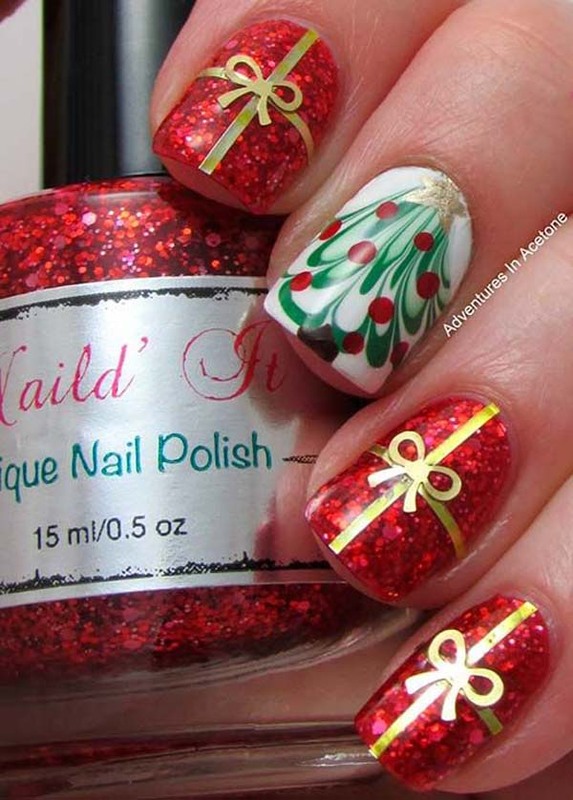 This nail art piece is absolutely festive for the yuletide cheer. Some chocolate shade on the bottom part makes the perfect contrast for the white tips. The red dots on the tip resemble the Christmas hollies. It’s positively attractive and yet so easy to make. Red and green are definitely the perfect colors fit for Christmas. Instead of using the good old red color, give it that soft feminine touch by using pink background. 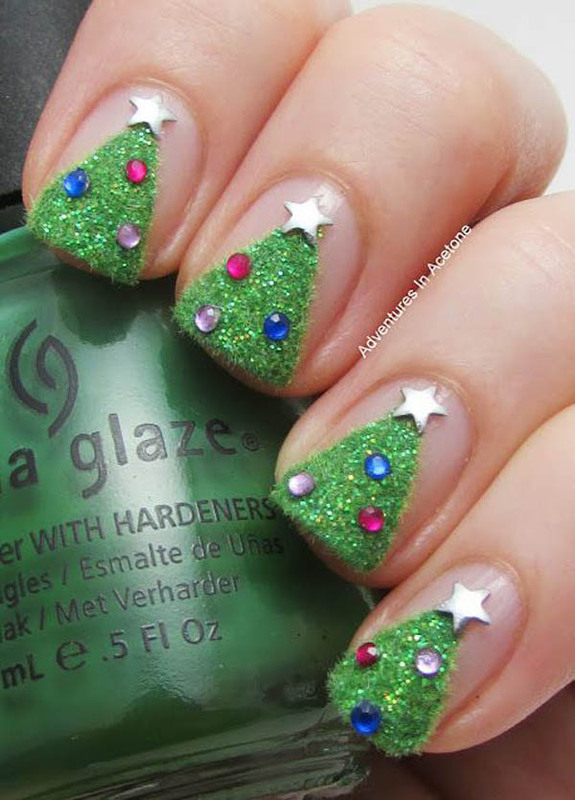 Use some glistening green polish to make the tree. Silver polish makes the best star topper and ball ornaments. 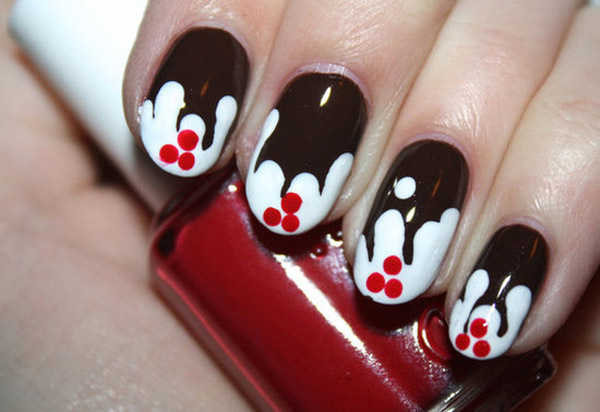 This easy to make nail art is definitely of the yuletide theme. The sparkling red tips are astounding. The lone Santa hat design sure stands out. It’s minimalist yet still captivating. 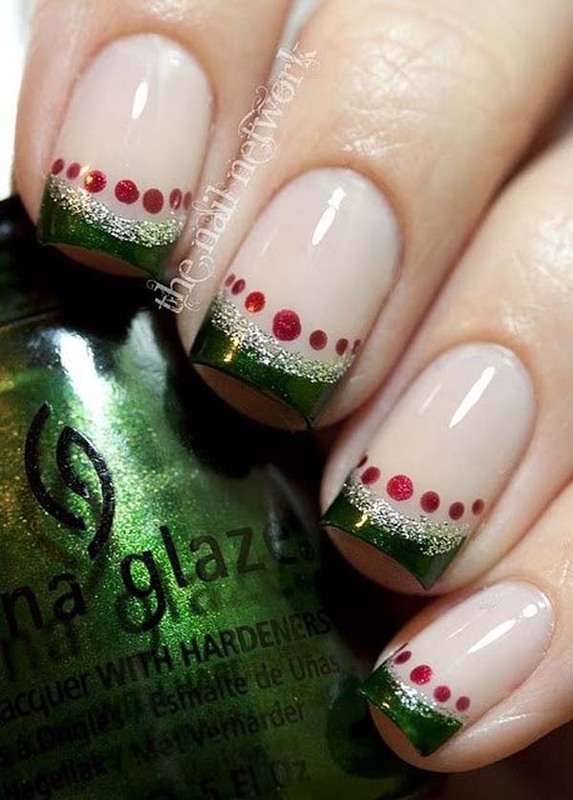 The red and green colors of this nail art are definitely suited for those holiday parties and events. The varying design on each of your nails makes one chic design. It’s easy to do yet it is just simply wonderful. The different Christmas symbols and figures are just completely likeable. 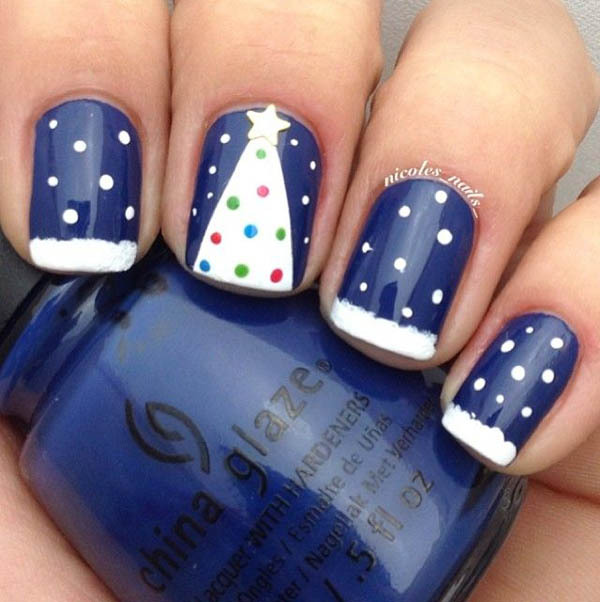 This astonishing nail art design is definitely just suited for the holiday cheer. The deep blue shade is just marvelous. The white tips and dots aims for the snowy effect. The lone Christmas tree design is definitely enticing. French tips always connote style and elegance. 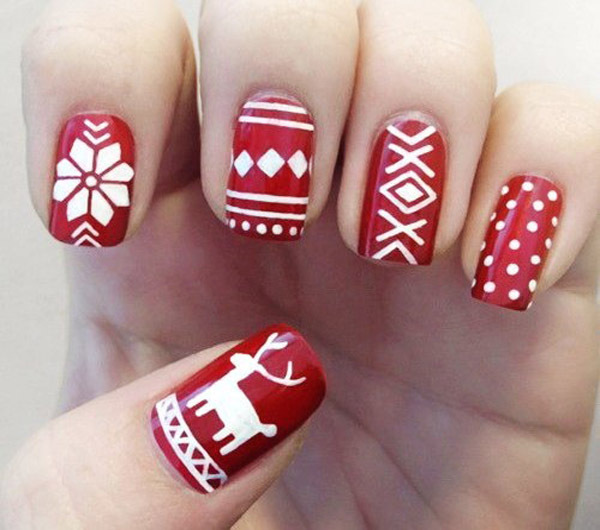 Add some Christmas spirit to your nails with this quick fix. 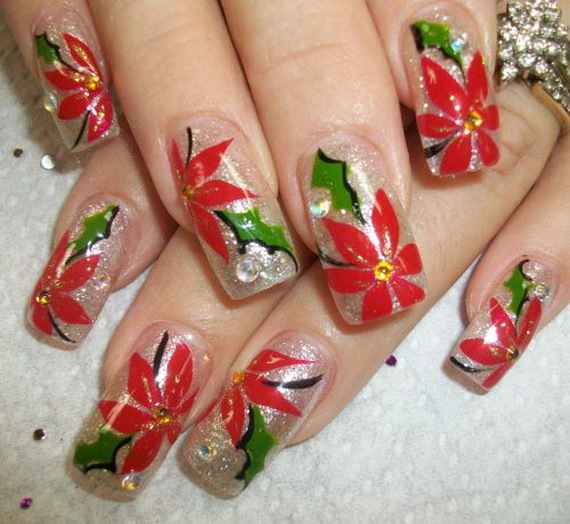 Place small circles on the edge of the white tips with red and green polish. 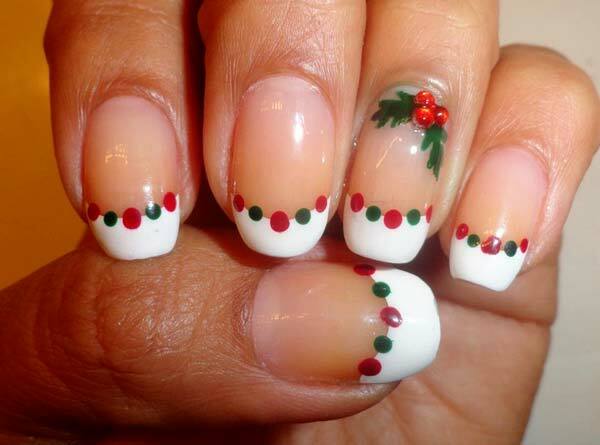 Use some nail art accessories to make the Christmas hollies. Some nail art decals would do just fine for this theme. 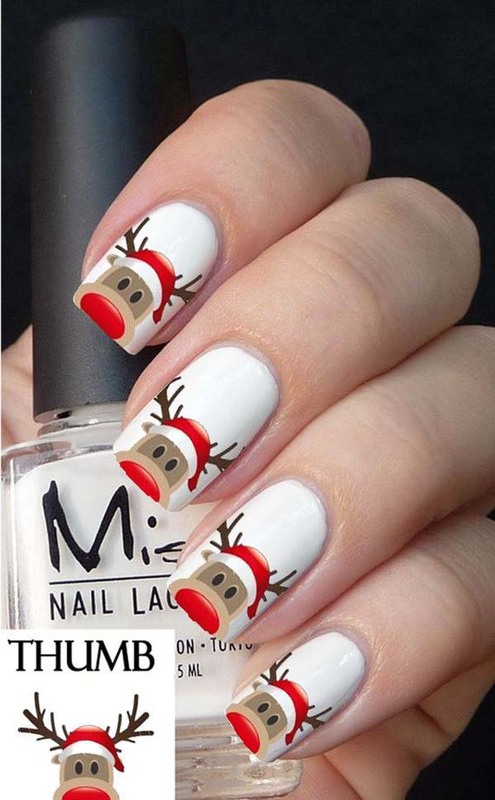 The reindeer faces on your nails utter nothing but Christmas. Use white polish for the base and background. This allows the design to be highlighted just fine. 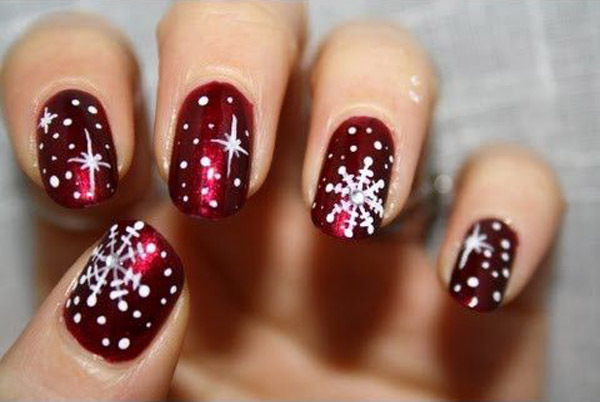 Gum drops glittering brightly on your nails will sure make the holidays a lot more stylish. The light tint of the base polish allows the gumdrops to be perfectly emphasized. Colored textured glittering polish would be the perfect lollipops. Add further adornment by drawing some white small circles and a line for the stick. The different styles on each of your fingers are sure trendy. Each finger designed with different iconic figures. It is colorful and definitely cheerful. To make the figures stand out more, use white polish for the base. 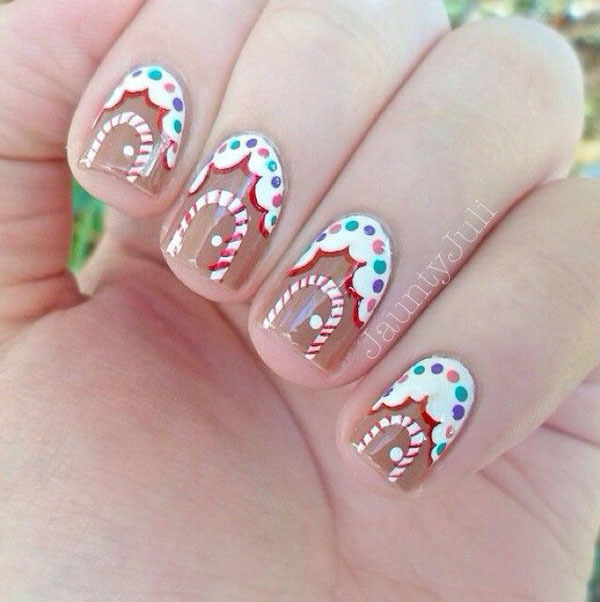 This nail art theme is definitely cool and fun. The different styles on each of your nails are definitely awesome and splendid. The rich deep blue color of the base paint makes these winter symbols stand out. This one fine piece is definitely a show of art. 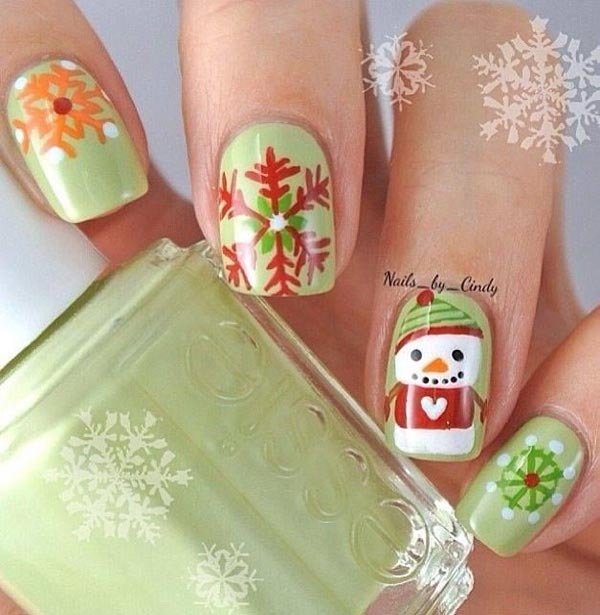 This nail art theme definitely shows the Christmas spirit. This beautiful design can be easily recreated right at the comfort of your own home. All you need is one light polish for the base. Then, stick some black Christmas sweater nail decal once it dries out. This easy-to-do manicure piece definitely has that positive tone. The different symbols make it more attractive. The light neon green polish as the back draft emphasizes the drawings wonderfully. It’s fine, attractive and light.